Reports any records in a feature class or table that have identical values in a list of fields, and generates a table listing these identical records. If the field Shape is selected, feature geometries are compared. The Delete Identical tool can be used to find and delete identical records. In this example, points with the OBJECTIDs of 1,2, 3, 8, 9, and 10 are spatially coincident (blue highlight). 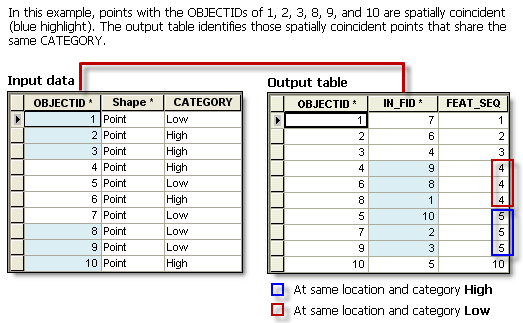 The output table identifies those spatially coincident points that share the same CATEGORY. Records are identical if values in the selected input fields are the same for those records. The values from multiple fields in the input dataset can be compared. If more than one field is specified, records are matched by the values in the first field, then by the values of the second field, and so on. With feature class or feature layer input, select the field Shape in the Field(s) parameter to compare feature geometries to find identical features by location. The XY Tolerance and Z Tolerance parameters are only valid when Shape is selected as one of the input fields. If the Shape field is selected and the input features have M or Z values enabled, then the M or Z values are also used to determine identical features. Check Output only duplicated records parameter if you want only the duplicated records in the output table. The output will have the same number of records as the input dataset If this parameter is unchecked (the default). The output table will contain two fields: IN_FID and FEAT_SEQ. The IN_FID field can be used to join the records of the output table back to the input dataset. Identical records have the same FEAT_SEQ value while nonidentical records will have sequential value. FEAT_SEQ values have no relationship to IDs of input records. The table or feature class for which identical records will be found. The output table reporting identical records. The FEAT_SEQ field in the output table will have the same value for identical records. The xy tolerance that will be applied to each vertex when evaluating if there is an identical vertex in another feature. This parameter is enabled only when Shape is selected as one of the fields. The Z tolerance that will be applied to each vertex when evaluating if there is an identical vertex in another feature. This parameter is enabled only when Shape is selected as one of the fields. Choose if you want only duplicated records in the output table. ALL —All input records will have corresponding records in the output table. This is the default. ONLY_DUPLICATES —Only duplicate records will have corresponding records in the output table. The output will be empty if no duplicate is found. The following Python window script demonstrates how to use the FindIdentical function in immediate mode. # Find identical records based on a text field and a numeric field. The following stand-alone script demonstrates how to use the FindIdentical tool to identify duplicate records of a table or feature class. # Description: Demonstrates the use of the optional parameter Output only duplicated records. Reads the output of FindIdentical tool and groups identical records by FEAT_SEQ value. # Run Find Identical on feature geometry only. # now, make a list of identical groups - each group in a list. # i.e., IN_FID 3, 1 are identical, and 5, 4 are identical.